Cataracts In The German Shepherd. The BEST! 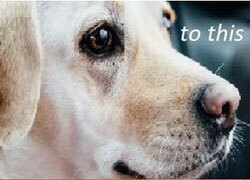 Information & Advice ONLINE that YOU need to KNOW on Canine Cataracts. In May 2018, GSDR took on a litter of 7 puppies all of which have bilateral total cataracts. The vet had advised the owner to euthanaise all puppies at 4 weeks old. Thankfully, we were contacted and all puppies are safe and doing well. This led to our quest to find a treatment that could help them. Basil is one of seven puppies born with congenital cataracts. At 4 weeks old the vet that examined them said that they are likely blind or very partially sighted. The prognosis for the puppies is unclear and whilst he said that they would all be functionally blind, it is harder to say if the presence of cataracts will go on to cause inflammatory disease in the eyes which may warrant further treatment. 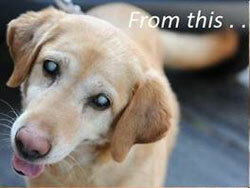 It was impossible to see the back of the eyes due to cataracts. Surgery for cataracts is not only very expensive but it is not always possible because of changes to the back of the eye which means removing cataracts will not restore sight. We very much favour natural remedies which are not only effective but they don't cost a fortune, unlike veterinary treatment. We came across this product Cataract Clear made by Costcuttersrus. Basil has begun his treatment and is receiving Cataract Clear 4% XTRAMAX 4 times daily. 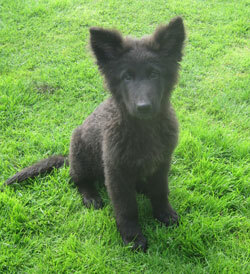 We know this won't be a quick overnight fix and that we are in for the long haul but we think Basil deserves a chance. What can we do about cataracts in dogs? By Brian Kinsey of Costcuttersrus, manufacturers and distributors of cataract treating eye drops called Cataract Clear 2% Ultra and Cataract Clear 4% XTRAMAX. First, let’s take a very brief look at the problem – Cataracts! Over time, advanced glycation products form in the eyes. These semi-opaque particles cloud the lens of the eye. Glycation is defined as the combining of protein and/or fat molecules with sugar. Someone who is diabetic is, therefore, more prone to get cataracts. These protein/fat/sugar particles remain in the lens of the eye, as the body cannot dispose of them. We pretty much have just two viable solutions. The first and most well-known solution is, of course, eye surgery that can provide excellent results fairly quickly. The downsides are that surgery and the aftercare can be very expensive, can lead to postoperative complications and is not always available to every dog due to age or current or previous health issues of the dog to be operated on. The second, lesser known and non-invasive solution is to use eye drops that are specifically formulated to reduce or completely remove cataracts. Unfortunately, of course, there are always those “snake oil salesmen” that promise the earth in their eagerness to make money selling ineffective rubbish that looks and sounds wonderful. There are numerous concoctions of so-called “cataract treating eye drops”, with different formulas that make some big promises yet deliver nothing but a hole in peoples pockets. N.A.C. is contained in numerous cataract treating eye drop solutions which are used to carry it to the front of the eye when those eye drops are placed in the eye. Whilst N.A.C. is the common and active ingredient, the ingredients that make up the rest of the solution can vary greatly which need to be considered - but more on that shortly. N.A.C. is a slightly modified form of a dipeptide molecule called carnosine (or L-carnosine) that – unlike L-Carnosine - is able to penetrate the porous lens of the eye and attach itself to the protein/fat/sugar particles known as cataracts and – in simple terms – creates a “new particle” in a form that the body can expel from the eye. These “new particles” detach from the eye lens and leave the eye through its surface which are automatically removed from the eye by blinking and teardrops. Sound good so far? It should, but unfortunately, as with any good idea, not ALL cataract treating eye drops that contain N.A.C. are created equally. 2. Contain a measly 1% of the active ingredient N.A.C. 3. Complicate matters by adding ingredients such as glycerine to their eye drops - which only impedes the recovery time – as well as other compounds like Benzyl Alchohol and other ingredients to make the solution thicker or more “gloopy” - all completely unnecessary in our opinion. After Treatment With Cataract Clear. Some time ago, the owners of Costcuttersrus found themselves in the position of having two beloved dogs who both developed cataracts. In a nutshell, due to the issues I have mentioned above, in our anger and disgust, we decided to see if we could provide a stronger, more “natural” and much cheaper N.A.C based cataract treating eye drop alternative to what was currently available – and we succeeded!! 2. It contains TWICE as much of the active ingredient N.A.C. 3. The solution is as natural as it can be and contains 2% N.A.C. in a suspension of distilled water, together with colloidal silver (free silver ions floating in a distilled water base). Colloidal silver is known to kill over 650 types of pathogens and is often referred to as “natures antibiotic” and facilitates a one year shelf life. Why not take a look at our website where you can also read about our new, stronger version of Cataract Clear 2% Ultra called Cataract Clear 4% XTRAMAX which contains a massive 4% of the active ingredient N.A.C. also comes in 2 x 15ml bottles and yet is still 2 or 3 or more times cheaper than other weaker, N.A.C. based products. Purchase Cataract Clear 2% Ultra or Cataract Clear 4% XTRAMAX. The proof of the pudding, as they say, is in the eating, so for your peace of mind we offer a full, no quibble money back guarantee. If you have any questions they might already have been answered in our frequently asked questions or you can contact us here and ask.